Canon is one of the trustworthy brands of printers around the world. People use the printers from this brand for printing both for personal use and professional use. Regardless of the purpose for which it is used, users of Canon printing hardware face the same set of issues when their printing machine encounters a problem. A Canon printer paper is commonly used for printing at homes and workplaces. While it works like a charm in most cases, it can lead to technical issues if handled incorrectly or inappropriately. Worse, it can put a total stop to prints at subsequent stages. That said, there are ways to not only resolve the issue manually but also take steps to keep it from happening. Here are the steps on how to fix paper jam in Canon printer. Make certain you follow all the steps systematically without omitting any of the steps. Step 1: Power the machine off. Remove the power cord from the main supply. Step 2: Open the cover on which the prints come out. Step 3: If you see a piece of paper on the front tray, consider removing it. 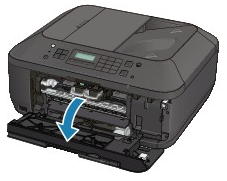 Touch the printer gently and avoid touching it in a way that it causes an issue. Avoid blotting or scratching the clear film as it may cause a technical issue. Step 4: Check if the jammed paper is under the FINE cartridge holder. If that’s the case, then you may need to shift the cartridge to the left or right edge depending on whichever you find it convenient to move. At the time of moving the FINE cartridge holder, hold it and slide it on one of the edges. Step 5: Hold the jammed paper and pull it out in case it is rolled out. Step 6: Now pull the paper gently in a way that it does not tear apart. Pull out the entire paper when you feel that more than half of the paper has already come out. Step 7: In most of the cases, some part of the paper remains inside the machine in some way or the other. So, before you proceed with the next step, make sure that no portion of the paper which you have taken out is inside the machine. To be doubly sure about it, check both the left as well as the right edges of the FINE cartridge. Step 8: Next, reload the paper after closing the paper cover. This needs to be done carefully. Make sure you are using the right kind of paper before reloading a ream. If you are not sure whether it is the right kind of paper for your printer, look at its size. This should ideally take care of the issue with a Canon printer paper jam. In case you still see the message on your computer screen, chances are some part of a paper is still stuck inside the printing machine. While paper jams are one of the absolutes of using a printer, you can elude this issue by taking certain precautions. If your job involves using a printer for most of the part, make a point of remembering the steps given below. Step 1: Try not to skip the servicing of your printing machine. Monitor it regularly whether your printer is in a fine working condition. Step 2: Make sure you load the paper correctly. This simple step alone will take care of most of your printing issues. 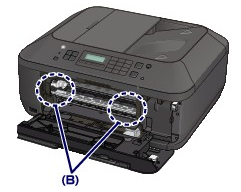 Step 3: Avoid positioning your printer at or nearby places with higher moisture content. This will prevent the possibility of wavy prints due to the absorption of moisture by the printing machine from the nearby sources. Step 4: Keep away from using paper of cheap or inferior quality. While such an act may give you the feeling of saving a few bucks but the way it harms the printing machine may compel you to splurge more on it. As a result, you may end up spending more than what you may save by paying less for the quality of the paper. Step 5: Moisture can have an adverse effect on the normal functioning of your printer. So, before closing your deal on buying a ream of paper from a retailer or a shop, make sure that it is dry and does not contain any moisture. So, there you go – follow these steps for how to fix paper jam in Canon printer and put the precautions to practice to stay away from dealing with the issue of canon printer paper jam too frequently. Most printer owners don’t know how to keep or use their printing hardware in the right way. Take care of your printing machine and this move will pay you dividends in the long run. This is the sure-fire way of reaping the benefits of having a printing machine or hardware at your disposal.